Amazon Price: $159.00 (as of June 10, 2018 7:24 pm - Details). Product prices and availability are accurate as of the date/time indicated and are subject to change. Any price and availability information displayed on the Amazon site at the time of purchase will apply to the purchase of this product. 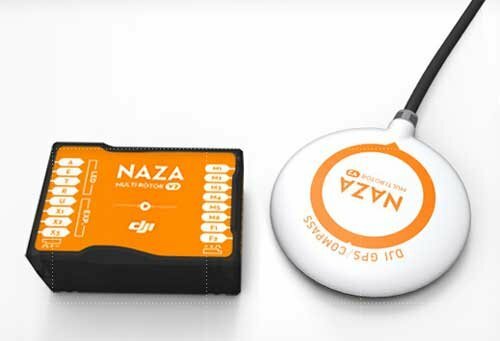 What’s new with the DJI Naza-M Multi-Rotor Auto Pilot Version 2 with GPS? Hardware PMU V2 – New case design with CANBUS port. Extra CANBUS ports, enhances the expandability of the system and will support Gopro Zenmuse, iOSD and Bluetooth module for assistant software use on smart phones in the future, etc. Firmware and functions -New attitude stabilization algorithm, provides better flight performance / maneuverability. New flight control performance, provides better flight experience; (flight control is smoother, take-off is easier). Support for Octo-rotor – One-motor stopped still can land safely (Hexa-rotor, Octo-rotor). Automatic course deviation compensation, reduced the effects of magnetic disturbance; interference around the compass detection & warning. Added IMU advanced calibration, error identification and warning, reduced the impact of sensor error to the flight performance.